While unfortunately some had to spend time in bed over Christmas and the New Year, further increases in the rate of influenza are predicted due to the cold weather. The rate of influenza in the community is monitored through sentinel surveillance carried out by public health authorities with the support of family doctors. There is an ongoing upward trend, and the highest rate reached is of 15 of every 100 people who visit the family doctor. Influenza poses a substantial burden on countries each year. It is estimated that 30 per cent of the burden of communicable diseases in Europe is due to influenza. Up to 50 million people each year are estimated to have symptomatic influenza in EU/EEA countries. Of these, an estimated 15,000 to 70,000 people die from influenza-associated causes. Between 290,000 and 646,000 respiratory deaths are estimated to be related to influenza worldwide. Apart from deaths, there is a high burden resulting from mild to moderate infections leading to work absences, losses to production and pressure on the health and social care services. Influenza is usually mild and most people recover quickly in a few days. However, some people are at high risk of serious complications, some of which can be life-threatening and can also result in death. The elderly, pregnant women, young children and people with underlying health conditions are more likely than others to develop severe disease and complications if they contract influenza. The chronic medical conditions that put people at risk include those of the respiratory system, such as asthma; cardiovascular system, such as coronary artery disease or heart failure; endo­crine system, such as diabetes; hepatic system, such as liver cirrhosis; renal system, such as chronic renal failure; and neurological or neuromuscular conditions, such as Parkinsonism. In addition, any condition compromising respiratory functions, such as morbid obesity (i.e. having a BMI over 40), physical handicaps in children and adults, and immunosuppression due to disease or treatment, including due to haematological conditions and HIV infection, put patients in a more vulnerable situation. One needs to protect one’s own health and that of others during the influenza season. Vaccination is the most effective way to prevent influenza. Health authori­ties continue to promote vaccination, especially for those who are more vulnerable. Immunisation of vulnerable people provides direct protection and also indirect protection of people in close contact with them. Furthermore, children aged under six months who cannot be vaccinated with current vaccines may be protected indirectly by protecting those around them. Vaccination is required every year since the immunity provided by influenza vaccines only lasts a few months and the vaccine coverage strains are adjusted every year to cover for the expected circulating viruses. Apart from vaccination, there are personal protective measures people may take to reduce their risk of acquiring influenza. Influenza is a viral infection that spreads from person to person, principally when people cough or sneeze, or by direct or indirect contact with respiratory secretions from infectious people, which can be found on hands or on surfaces. Avoid close contact with sick people. People with one or more of the following symptoms – fever, cough, sore throat, body aches, headache, chills and fatigue – may be infected with influenza or some other virus and may easily pass on these viruses. One should maintain a distance of at least a metre from someone with symptoms of influenza and avoid crowd­ed places. When distance cannot be maintained, especially when one needs to care for the sick, efforts should be done to reduce as much as possible the time of close contact with people who might be ill. In addition, do not unnecessarily visit people who are sick. Washing hands frequently can help protect from various infectious diseases, including influenza. Wash your hands thoroughly with soap and water, especially after you cough or sneeze. In situations where handwashing is not possible, alcohol-based hand sanitisers reduce the amount of influenza virus on contaminated hands. Avoid touching your eyes, nose or mouth since viruses are often spread when a person touches something that is contaminated with germs and then touches their eyes, nose or mouth. Most times, the whole family gets the flu but this can be prevented through personal measures to protect close contact. The main prevention measure is to maintain good respiratory hygiene. Nasal and oral discharges have a high amount of viruses, so people who are sick should cover their mouth and nose using tissues when coughing or sneezing. If tissues are not available, to avoid transmission one should cough or sneeze into an arm rather than in the hands. Tissues should be thrown in the bin after use. Washing hands will help protect others from viruses. There is little evidence that wearing face masks outside of healthcare settings during the influenza season offers effective protection or reduces transmission, and most authori­ties do not recommend their use. People who are sick should stay home and not go to work or school, and limit contact with others. 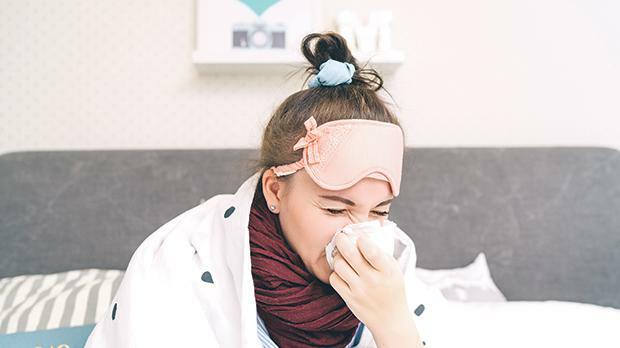 Adults who are sick can infect others for about five days after symptoms start, and children are infectious for about seven days after the mani­festation of symptoms. Taking care of yourself through preventive measures, including vaccination, is important to stay healthy and prevent contracting a virus during this flu season. For those who have not taken the flu vaccine, it can still be taken, as we still have a number of weeks with the flu around us. The vaccine is available from health centres and is free of charge to all people aged over six months. Professor Charmaine Gauci is Superintendent of Public Health.